Get a head start on the season by growing your seeds indoors. If you live in a cool area, you can use a greenhouse or cold frame. Otherwise get the most from your growing season and start seeds indoors... window sill, top of the fridge or the coffee table. Or think about an enclosed porch, a garage, a shed or basement. Growing seeds inside is pretty straightforward. Give them air, light, water, warmth — and they'll do what they're meant to do — sprout. Working space: Make sure you have sufficient counter space to work on, or keep a protective covering handy to spread out if necessary, so you can do your seed planting without an almighty mess. 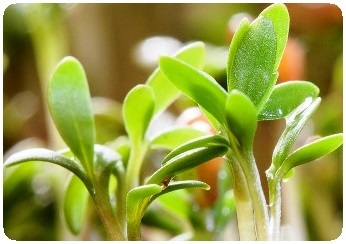 Water and cleanliness: Have water handy to use once seeds are planted. Also keep an old towel nearby for wiping your hands often. This is so that you don't let any soil or moisture into your seed packets and remaining seeds you may be storing for later use. The best way to water seed pots is to put them into larger trays and fill with water. This way the seed pots soak up water from the bottom. Otherwise spray carefully with a fine rosed watering can. For ongoing water, pour more water into bottom trays or use a mister spray bottle. Timing: Don't start planting seeds too soon. In 4-6 weeks they will be ready to go out into the garden. If you are still experiencing frosts, it will be off with their heads! Preparation: Prepare your containers. Do you have enough trays, egg cartons, milk or yoghurt containers or newspaper pots. Make sure they have drainage holes... and if left over from last season, check for rotten bottoms. Have labels and marking pen, and use them immediately you have sowed each variety of seeds. Too bad if you forget, because it's guesswork otherwise. Clean & disease free: If in any doubt about lingering pests or disease fungi in old pots, sterilize them with a plunge into a bucket filled with 1 part household bleach and 9 parts water. Light: Your indoor seedlings are going to need a lot of light once they germinate... more light than an adult plant, to make them grow fast and strong. So unless you have brilliant natural light, try and arrange lights over your seedlings. Keep this indoor lighting just above to your seedlings... about 7cms (2-3 inches) away, moving up as they grow. Preferably use fluorescent or one of the latest energy saving lights. They are more economical, they cover a larger space, they run cool (without burning the plants) and they use less electricity than incandescent lights. Purpose built grow lights or fluorescent grow bulbs are excellent. You may need to have these lights on for at least 15 hours a day to provide optimum conditions for seedlings... they MUST have good light and for a long time. Fresh air: Put a fan in the room on low to keep the air circulating. This is surprisingly important. If the air is static the plants will not prosper. 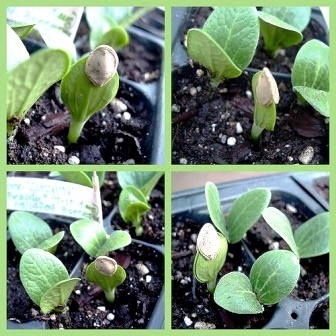 Temperature: Seeds need a warm environment to germinate. They will be comfortable with temperatures between 15-21°C (60-70F) during the day and will generally tolerate 10-15°C (50-60°F) overnight. Heating the soil will speed up germination, even though the surrounding air temperature may be chilly. Using seed heating pads or mats, even hot-water bottles and electric blankets under your seed trays, can make it possible to produce soil temperatures in the 80's. The difference between soil temperatures of 15-21°C (60-70F) and 26-30°C (80-85F) mean seeds germinating in two weeks or one week or less — that's half the time! Insulation: At night, covering them with plastic, fabric or newspaper can assist in keeping them warm until they sprout. Mini bench glasshouses can be bought, or made, eg: Bend some coathanger wire or similar to form arches to go over your seed pots or trays, then cover with clear plastic or plastic bags. Clear plastic supermarket trays with hinged lids that are used for cakes, salads and soft fruits like berries etc, make nice little mini glasshouses. If you don't buy them, then like me, you'll see them in other people's homes or their recycle rubbish. Ongoing food and water: Make sure your indoor seedlings are kept moist but not soggy. Once proper leaves appear (the first two are just seed leaves called cotyledons), feed them with a weak liquid fertilizer mixed with water. Transplanting: If you have started your seeds in flats or trays as some gardeners do, you can transplant each seedling into its own larger pot. This is called 'pricking out'. Once they then reach a decent size they can be planted outside in the garden. The less root disturbance the better for seedlings, so this double handling method is not recommended unless you are careful and skilful. If you sow your seeds in individual pots or in trays with plenty of space between each seedling, you can simply keep your seedlings there and transplant straight into their permanent spot in the garden when large enough. 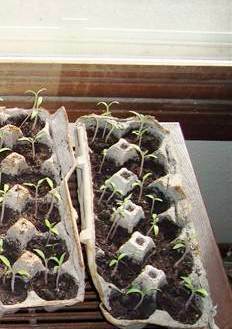 Hardening off: As the seedlings mature and near time to enter the garden proper, they need to be 'hardened off'. This means moving them outdoors for progressively longer periods each day. 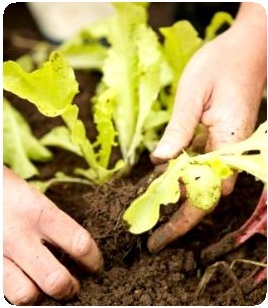 Start toughening them up, by putting them in a protected part of the garden and bring them back in at night. As they get stronger, they will be well prepared to withstand the actual conditions full time in the garden once you turf them out for good. Growing the best tomato seedlings? Garden lovers love this store!